So far in this book, you have learned how to test for the difference within one group of data between the mean of the group and the hypothesized population mean for the data using either the 95 % confidence interval about the mean (Chap. 3 of this book) or the one-group t-test of the mean (Chap. 4 of this book). You have also learned how to test for the difference between the means for two groups of to determine if this difference was a “significant” difference (Chap. 5 of this book). In this chapter, you will learn how to test for the difference between groups on a single variable when you have three or more groups of data. A practical engineering problem is presented that walks you through the Excel steps needed to generate the output for a one-way ANOVA test. You will learn how to interpret the Summary Output table correctly, and how to test the hypotheses comparing the population means of the three or more groups to see if they are “significantly different from each other.” If this overall ANOVA test is produces a significant result, you will learn how to test the hypotheses comparing any two groups using an ANOVA t-test formula. This formula is presented, explained, and a practical engineering example is used delineating the five steps needed to perform this test using a calculator. Then, the Excel steps for using this formula are presented and explained. 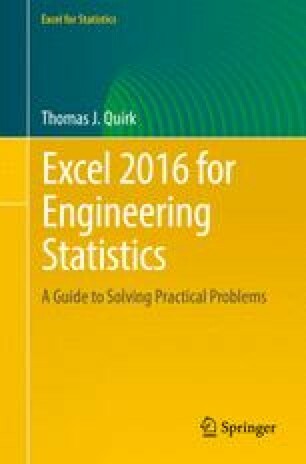 Three practice problems are given at the end of the chapter to test your Excel skills, and the answers to these problems appear in Appendix A of this book. An additional practice problem is presented in the Practice Test given in Appendix B along with its answer in Appendix C of this book.